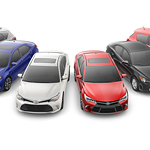 Toyota has certified pre-owned vehicles since 1996. With a track record of success, it's the easiest way to buy a used vehicle. With a private seller, you never know exactly what you're getting. Has it been properly taken care of? Is the transmission or engine in poor condition? Has it been in previous accidents? With the pre-owned program, you don't have to worry about it. On top of getting a high-quality, low mileage vehicle, you also get an industry leading warranty program. You get a 12-month/12,000-mile Comprehensive Warranty as well as a 7-year/100,000-mile Limited Powertrain Warranty. Stop by today to take a test drive.